Read each of the texts below and then complete the sentence, which comes under the text, using no more than five words to show that you have understood the text. An example has been provided for you. 0. Chee Soon Juan, leader of the Singapore Democratic party, pleaded not guilty to the charge of speaking in public without a permit, over a speech made in February. The case highlights the state restrictions on free speech. 1. The attempt by Beyoncé and Jay-Z to register their infant daughter’s name as a trade mark in the US appears to be continuing in spite of the fact that a wedding planner, who has been running a business with the same name since 2009, has been given the go ahead by the US Patent and Trademark Office to carry on using the name Blue Ivy for events. This entry was posted in Reading and tagged czytanie, egzaminy MON, level 4, military English, mock exams, poziom 4, reading, reading comprehension, SLP 4444, SPJ 4444, SPJ4444, STANAG tests, tests, wojskowy angielski on 01/02/2013 by Paweł Jasiński. It’s another STANAG 6001 test derived from the Central Examination Board for Foreign Languages of the Ministry of National Defense (CEBFL) in Poland. Again, it was adjusted a little to make it easier for the site visitors to practise on-line. You are going to listen to six news items. Listen and choose the best answer A, B, C or D. You can hear the items once only. I repeat, once only. Take a break of 30 seconds before each news item to read through the questions to that item. This entry was posted in Listening and tagged egzaminy MON, exam format, level 4, listening, listening resources, military English, mock exams, poziom 4, SLP 4444, SPJ 4444, SPJ4444, STANAG tests, wojskowy angielski on 12/08/2012 by Paweł Jasiński. Below you will find an example of a report on one of the previously presented topics. It deals with a fictional need of language training in one of the Polish military unit. The original task for this answer is here. This report is to propose a constructive way forward regarding how to equip a classroom with necessary teaching aids and find teachers to support language training within the unit. Our unit has to adhere to the MoD Directive 2349-2012 and reach the assumed interoperability in terms of language skills by the end of 2013. This will require providing additional language classes for 80 soldiers next year. This entry was posted in language skills, Writing and tagged egzaminy MON, level 4, military English, military reports, mock exams, pisanie, poziom 4, SLP 4444, SPJ 4444, STANAG tests, wojskowy angielski, writing on 12/05/2012 by Paweł Jasiński. Your unit is going to organize its own language classroom to intensify language training of the unit and you have been tasked with writing a report on the matter. In your writing (1)propose basic equipment the classroom should contain to provide proper language training (2) propose trainers to be responsible for the whole language course (3) discuss organizational issues (4) speculate how long the course should last (5) analyze the possibility of outsourcing option (6) make recommendations on the course programme. Justify your opinions. Write between 500 and 600 words. You have 70 minutes for this task. Below are some prompts that may help you. Why tablets are lousy learning devices and how they could be better? Tablet ownership among college students has correspondingly skyrocketed and a Pearson Foundation survey found that it has tripled from a year ago. One-quarter of college students currently own a tablet. 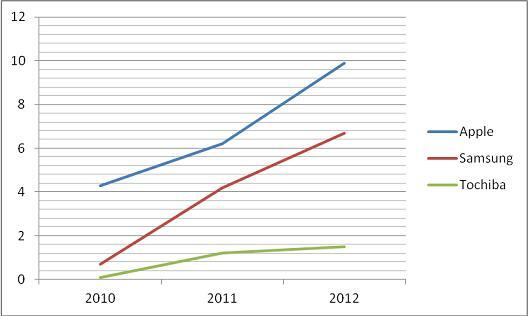 Tablets sales figures from 2010 to 2012. Units in millions. Modern Teaching Co. provides your organization with the appropriate task-tailored language training, meeting all specified requirements. Our teachers proudly work for various military units Europe-wide. Negotiable rates start from €30ph at our premises or in your unit if requested. This entry was posted in Writing and tagged egzaminy MON, level 4, military English, military reports, mock exams, pisanie, poziom 4, SLP 4444, SPJ 4444, writing on 11/29/2012 by Paweł Jasiński. As far as the exam requirements are concerned there is nothing surprising about the fact that your four basic linguistic skills will be tested. There is a fixed sequence of the skills tests. Reading goes as the first one, then listening follows, then writing and eventually speaking. In each part the examinee should show his/her proficiency in English, but how we are marked for our performance depends on the assessment criteria and the assessors’ evaluation. Fortunately, the assessment criteria are not a mistery any longer. The assessment criteria introduced to Polish examination boards are very simple and clear. For each part of the exam you can receive 20 points in total. Many people are familiar with that number of points to get, however, not many know that the total number of points you are awarded consists of four components (applicable to so called productive skills only). For each skill there are different components which are subject to evaluation during the exam. 4) organisation – max. 2 points. 4) interactive ability – max. 3 points. If you fail any of the productive components, you cannot pass the whole skill part of the exam. E.g. you can get 6 points for writing accuracy, 6 points for lexical range, but you failed in task achievement and you got two points for organisation. The total number of points is 14, theoretically it still is the pass mark, but since you didn’t achieve the overarching goal of your task, you are not given the credit for your writing. To make things worse, to pass the components you are required to fit your performance into so called ‘top band‘ or ‘pass band‘. It means that in case of grammatical range and accuracy you have to obtain at least 4 points out of 6 available in the rating scale. good fluency, hesitations to order ideas but not in search for lexis. because of frequent groping for words. This entry was posted in Listening, Reading, Speaking, Uncategorized, Writing and tagged czytanie, egzaminy MON, exam strategies, level 4, poziom 4, reading, reading comprehension, SLP 4444, SPJ 4444, STANAG tests, writing on 10/17/2012 by Paweł Jasiński.